Roll out the pastry on a lightly floured surface, then slice into three long strips. Line a baking tray with parchment paper. Transfer the pastry to the tray and prick all over with a fork. Refrigerate for 30 minutes. Preheat the oven to 200°C/180°C fan/gas mark 6. Brush the pastry with the beaten egg and bake for 15 to 20 minutes until the pastry is puffed and crisp. Set aside to cool at room temperature. Beat the mascarpone and cream in a mixing bowl until smooth. Beat in the icing sugar and orange zest until combined. Stir the jam and orange juice in a small bowl until combined. 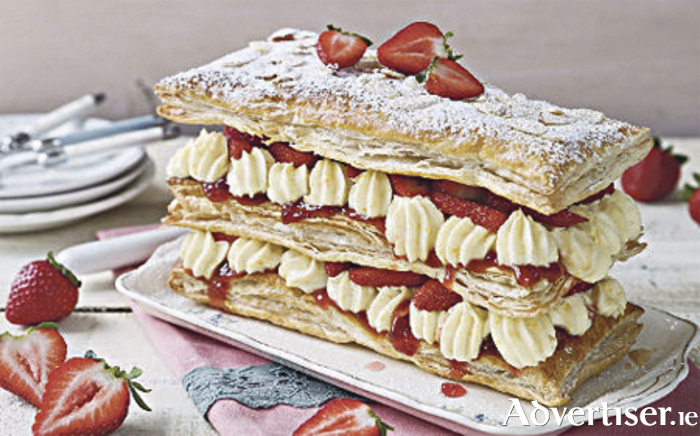 Place one pastry sheet on a serving platter and spread over one-third of the jam mixture. Top with 1/3 of the cream, then arrange 1/3 of the strawberries over the top. Repeat these layers twice more. Finish with a sprinkling of flaked almonds and a dusting of icing sugar. Do not forget to turn the clocks back!